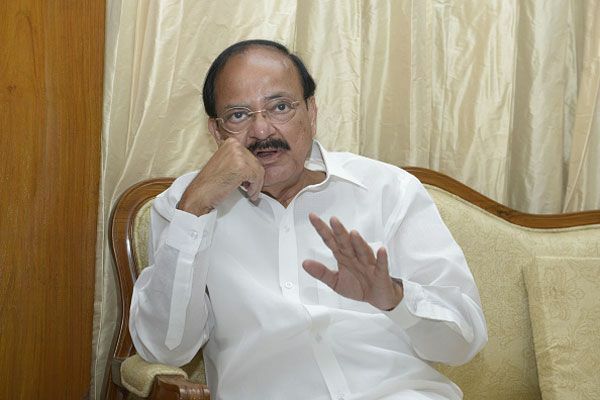 Union minister and senior BJP leader M Venkaiah Naidu on Tuesday hit out at Congress as it marched to the Rashtrapati Bhawan, saying politically-displaced people were challenging the democratic mandate and were resorting to such dramatic actions out of their desperation to stay relevant. Alleging that political intolerance was in Congress' genes, Naidu said they are going to the wrong address as they should have gone to Raj Bhawans instead, as such stray unfortunate incidents happened in states ruled by Congress or its friendly parties. "Congress talking about intolerance is like devil quoting scriptures," he said, adding that the mass exodus and genocide of Kashmiri Pandits happened during their regime. "It is a well-organised effort to defame our cultural ethos which are based on time-tested traditions of accommodation and acceptance. "This ongoing campaign is a clear effort to derail developmental momentum. They don't want Modi government to succeed. Now to say that intolerance is raising suddenly is far from truth," he said. On Congress taking the intolerance issue to President Pranab Mukherjee, he said, "How can a party which has imposed Emergency talk about intolerance. People are laughing at them." "What is happening is that politically-displaced persons are challenging the 'janadhesh" (public mandate). It is leading nowhere, as they have lost people's confidence, are desperate and are trying to stay relevant with such dramatic actions," he told PTI. He accused the Congress of being most intolerant and said, "It has political intolerance in its genes. Since independence, they never tolerated dissent. Political intolerance is a genetic trait of the Congress." Naidu said they have lost public support and mandate and are now feeling threatened after the regime change. Taking a dig at tearing of an ordinance of UPA Cabinet, the Union Minister said, "The country has not forgotten how badly even Dr Manmohan Singh was treated. What kind of tolerance was it when Congress vice president convened a press meet and declared that Dr Singh's cabinet decisions deserved to be thrown in dustbin." He said they do not have any moral right to accuse others for non-existing issues and asked how many books were banned by Congress government when it was in power, including that of Salman Rushdie. "The anti-Sikh genocide was justified by their leaders saying 'when a big Banyan tree falls, the earth shakes'," Naidu alleged. The Minister said for 60 years Congress has been in power, and it has an Octopus-like presence in most of the academic and cultural institutions. The Leftists also joined them and became beneficiaries of the patronage, he alleged. Naidu also said that of the 1,200 people given Sahitya Akademi awards, only 39 have announced that they were returning their awards, of which four-five are yet to do so.